Free delivery - this is available on most orders when you reach a minimum order value for your packaging type which is based on the size and quantity of plants that you order. Details are in the delivery information table below. There are exceptions to the standard delivery pricing structure for deliveries to specific areas (Highlands, N. Ireland, Isle of Man etc.) or for tall or heavy plants. For more information see the Further Delivery Information section below. It's Convenient - no need to wait in all day to sign, we don't need a signature (the odd, larger order may require a signature but will be delivered at a mutually agreeable time). It's Tried & Tested - we use only couriers who have shown consistency in their efficiency & care. We try to keep our delivery charges on lower value orders as reasonable as possible; in some cases, the charge won't always cover the full cost of delivery, but will contribute to it. British Mainland (excluding Scottish Highlands and AB or DD postcodes) - Delivery charges and Free Delivery Minimum Order Values as per the table on the main page. Scottish Highlands and AB/DD postcodes - Possible delivery surcharge for boxes dependent on location and quantity/type of plants ordered. For pallet deliveries in particular, there will be a delivery surcharge for these areas. Please call us on 01257 263 873 for advice and costs. Northern Ireland, Isle of Man, Isle of Wight, Scottish Islands, Channel Islands and Ireland - We can deliver to these areas but in most cases there will be a delivery charge due to the non-mainland location. Please call us on 01257 263 873 for advice and costs. Other locations: it may be possible to deliver to other locations - please contact us on 01257 263 873 for a bespoke quotation. If you have placed an order that includes products on pre-order, then they will be despatched to you as soon as they are available. If your order includes pre-order bare roots or root balls you will be notified once the items are being despatched (root balls from mid to late October and bare roots from early to mid November). Please note that a combined order of in-stock items and pre-order items will normally only be sent when ALL items are in stock (with the exception of cell grown plants which are sent direct from our growers within 5 days). Should you wish to split your order and take delivery of all items available now please call our customer service team on 01257 447 522 who will assist you. Please note that this could be subject to further delivery charges..
Orders requiring pallet delivery are bulk orders and/or orders for large hedging plants which can't be shipped in boxes. Look for the pallet icon on the product listings. There is a minimum spend of £240 inc VAT to qualify for free delivery. Otherwise we charge £60 delivery. Please note that for pallet deliveries to the Scottish Highlands plus AB or DD postcodes, there will be a delivery surcharge. Please call the sales team on 01257 263 873 for advice. The vast majority of our orders are sent using either Parcel Force's 24 hour service or our local pallet company who are part of an international network, again on their 24 hour (or sometimes 48 hour) service. For extra tall hedging plants of 2.25m and over - see our 'Extra Tall Plants - Delivery and Minimum Order' section. Deliveries requiring Tall Boxes are usually bare roots of 120cm and taller. Unlike pots of this size, bare roots are lightweight so do not require a pallet. Delivery via Tall Box is indicated by the box icon on the product listings. For Tall Boxes, we have a minimum order value of £120 incl. VAT to qualify for free delivery, otherwise delivery is just £25. This is due to the packaging size and logistics requirement to ship these boxes. Extra tall plants (over 2.25m) cannot be transported on standard pallet lorries. We have to use a dedicated haulage lorry, but the benefit of this is that normally only your plants will be on the lorry. As there's a high cost for this, in some cases we have to impose a minimum order quantity in order to be able to afford to give you free delivery. Products in this group have both the pallet icon and the forklift icon on the product listings. We can give free delivery and still give a discount off the price of the plants. You could collect via prior arrangement from our nursery. We are happy to work through the delivery options with you to try to give you what you need at the best possible price. Delivery of these products is made via large articulated lorries. It is essential for delivery, that access to your property allows for this size and type of vehicle. If a vehicle of this size cannot access your property, please call the team on 01257 263 873 to discuss bespoke options for delivery. Due to the size and weight of these products you will also need to have lifting equipment in place to move them from the lorry to your planting location. It takes us a couple of weeks in early November to despatch all the pre-orders that have been placed by customers between July and late October. After that, we aim to turn orders round within 3-5 working days, however exceptionally busy periods may see this extend to 5-7 working days. If ordering smaller quantities in a variety of species rather than a single species, this may take longer to dispatch as we can only do selective picking in quieter periods. Please bear this in mind if ordering in this way. * Please do note the minimum order value criteria for free delivery for tall bare roots 1.2m and above in the section 'Deliveries Requiring Tall Boxes' as this is different to a standard box. These are kept in stock at all times and are normally dispatched within 3-5 working days of the order being processed - if we cannot dispatch your order within 7 days, we will notify you. There is a minimum order value for Cell Grown Plants of 12 units on all species. * Please note that if placing an order for cell grown plants along with other products, the cell grown plants will arrive separately as they are sent direct from our growing site. We keep quantities of most sizes in pot grown plants available at all times at our dispatch centre ready for dispatch within a couple of days of the orders being received. 95% of our orders are dispatched within 3-5 days but occasionally and depending on demand, we do need to call in stock from our growers in which case delivery will be within 7 days to allow us time to bring the plants into our dispatch centre. If delivery is going to be longer than 7 days, we would contact you to inform you of the delay and to agree a delivery date with you. If you wish to cancel your order at this stage, you may of course do so, and your debit/credit card would be reimbursed in full. Root ball plants are lifted from the fields to order so please order in good time before you actually need the plants. The benefit of this approach (rather than lifting the plants and holding them - out of the soil - on the nursery) is that the plants are really fresh and that gives them a better success rate. In peak season, we lift plants twice a week so there's never a long wait for them. We aim to deliver within 3-5 days in this period although at the busiest times this delivery time can extend if demand is high. As the season slows and demand with it, we will only lift once a week. Delivery at this point would be within 7 working days. If stock is unavailable or delivery delayed, we will inform you immediately on receiving your order. Not quite ready to plant when plants delivered? Bare roots can be kept in a sheltered area like a shed (protected from drying winds) for a few days/up to a week - just open up the package and keep the roots moist. If you need to keep them longer before planting, they'll need to be "heeled in" in which case they'll be fine (again subject to watering) until early spring (end of March/very early April but the sooner the better) - but they must be permanently planted whilst dormant. 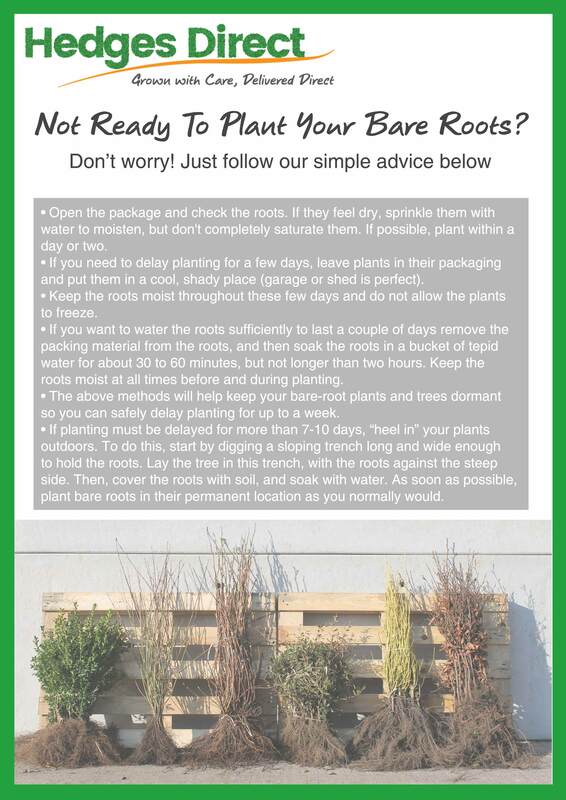 CLICK HERE to read our detailed advice guide on how to store and care for bare roots if you are not ready to plant when they are delivered. Root balls also need to be kept moist and we recommend planting them as quickly as possible after delivery because evergreens suffer more than deciduous plants from being moved. Cell grown plants can be kept for a week or so prior to planting providing you water them and keep them in a sheltered place. Pot grown can be left in their pots for a few weeks - just keep them well watered but not waterlogged. The simple answer is No! All our deliveries are sent 'No signature required'. Please leave us instructions in the Delivery section of the checkout for where deliveries should be left - but please be reasonable - we can't expect carriers to leave them "in the shed at the bottom of the garden". For orders being delivered on a pallet or via a large articulated lorry in the case of extra tall/large plants, we do not require a signature for delivery, but in general people prefer to be at home to oversee the delivery. This is sometimes advisable as pallets can be difficult to manoeuvre so the driver may need to be shown where the pallet can be safely left. (If it's a gravel drive you may need to unpack the pallet at the gate). Extra tall plants will also require access for a large articulated lorry and have lifting equipment and an operator available to move plants into the planting location. If you cannot be there to receive the delivery, please provide specific instructions as to where the delivery should ideally be left, taking into account it will need to be accessible for the lorry, with plenty of space for the driver to easily unload and deposit the delivery. We can then pass on your instructions to the pallet company. This can all be discussed when we liaise with you to agree a convenient date for delivery. The arranging of specific delivery dates to suit is a service that we currently offer free of charge in order to help our customers. Whilst we do our level best to meet requested delivery dates, please note that we cannot be held accountable tif there are delays due to unforeseen circumstances. Please do not arrange for gardeners or contractors to be waiting for the plants in case of unforeseen issues resulting in the delivery not arriving as originally scheduled. We will not pay any compensation if we do not meet a specific delivery date due to circumstances beyond our control. Plants Delivered But Not Ready To Plant? We have specific criteria for returns and refunds - please see our Terms and Conditions page for comprehensive information, specifically Sections 7 - 9. Special Note: If you wish to return plants due to a surplus, no longer requiring them or purchased in error, you will incur both a return cost (cost differs dependent upon box or pallet shipment) and the original cost of delivery incurred by Hedges Direct. Please contact the Customer Service team for charges and/or to organise a return. Please be aware that plants will be subject to a quality control check form our Nursery upon return prior to any refund being authorised and processed. * Please note: when applying discount codes, delivery charges apply to the total order value in the cart after discounts have been applied.